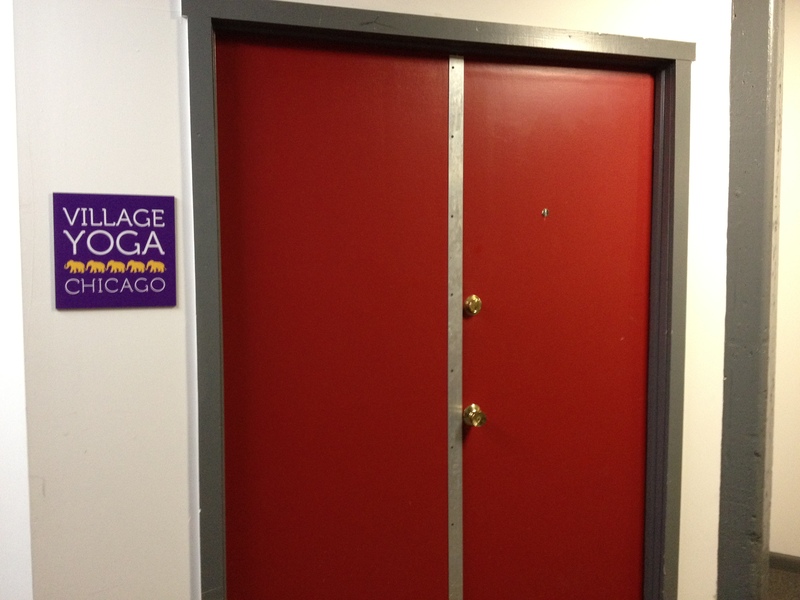 My co-worker Erica, who introduced me to Native Foods, recently told me that the West Town yoga studio she used to go to was opening a new location in Lincoln Park. Better yet, Village Yoga was having free classes at the new location, so she urged me to try it. Along with the good price (free! 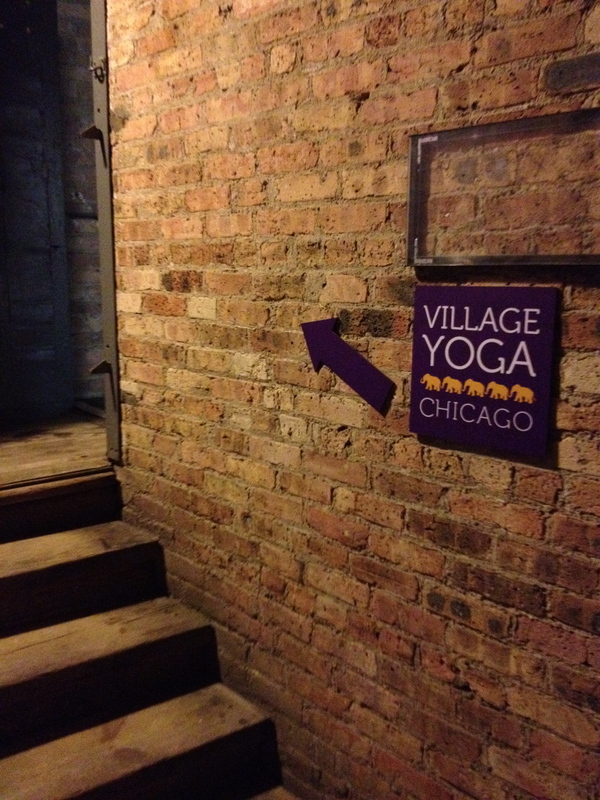 ), I also wanted to go because Erica had only nice things to say about Alyson, who owns Village Yoga. Erica explained how Alyson really takes the time to get to know everyone, and never makes you feel uncomfortable about your skill level (phew). So I scheduled myself for a beginner class. And hoped that someone would go with me. But no one could, so this was a solo mission, whether I liked it or not. I had a little anxiety about going to the yoga class for a few reasons. #1-I’m a little anxious by nature. I worry about everything from what’s in my food to germs to if I’m going to be a good mom one day. (No time soon…sorry, friends!) #2-I get nervous to do things alone. I’m not sure if it’s because things are always better when you share them with someone, or if it’s because I’m just not as confident of a woman as I think I am. (Sassy? Yes. Independent? Maybe not always.) #3-I’m not very good at practicing yoga, probably because I don’t do it often enough. However, I’m really great at the end of the sessions when you relax and connect your mind, body, and spirit, but I’m just not as strong (physically) as others. Gosh, what is this—Oprah? Erica told Alyson that I would be coming to the class, so that really meant I couldn’t back out of it. (I’m really glad she did.) I got to the studio a little early to make sure I wouldn’t be late. The signage made it easy to find the studio in the industrial building, and I immediately felt comfortable as Alyson greeted me with a warm smile upon arrival. I removed my shoes, signed a release form (I’m a clumsy, and I’ll take responsibility for it! ), and paid $2 to rent a yoga mat. 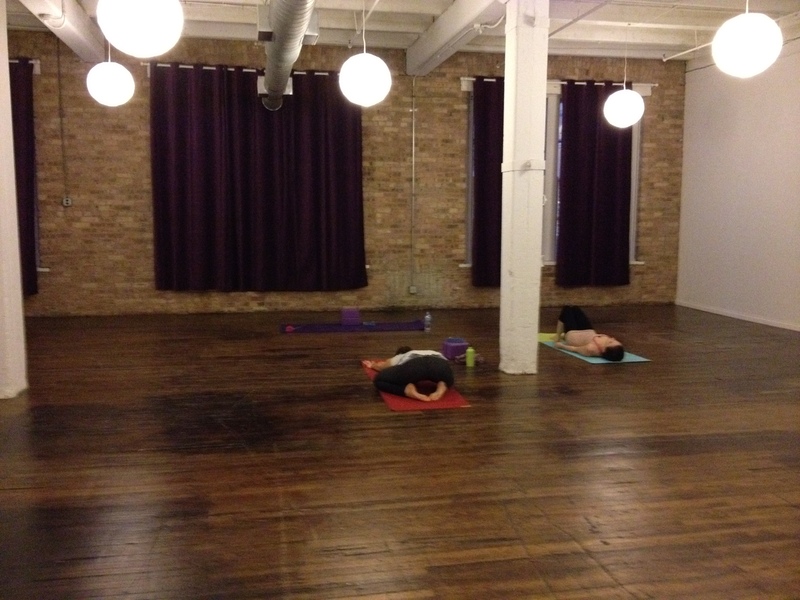 The actual yoga studio was very open, loft-like, but inviting. 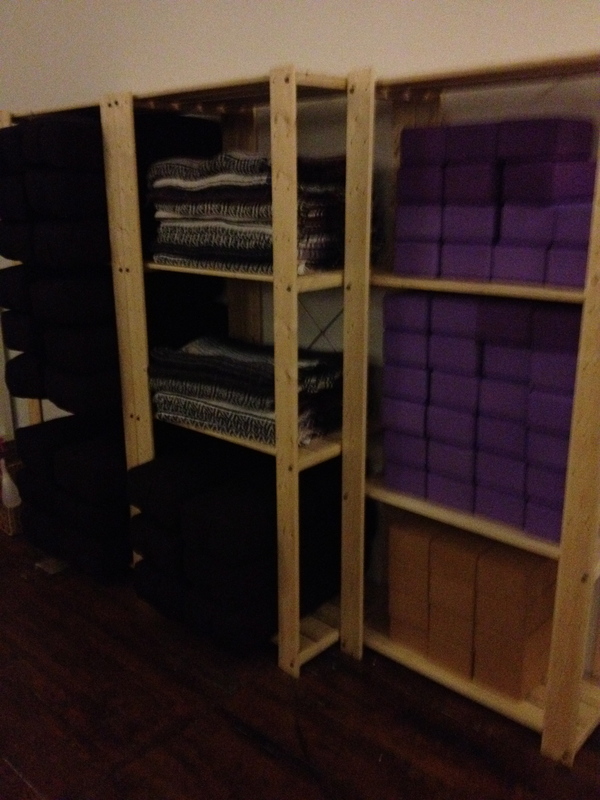 The back wall was filled with shelves of new equipment that had never been used, like yoga blocks, straps, rug mats, and more. There was a hint of fresh paint in the air, which I kind of liked. I found my place toward the back of the room, but there was no hiding from Alyson. We started off with some yoga sequences, followed by holding more complicated poses, and finished up with the relaxation portion. The hour-long class flew by. Alyson was an excellent instructor, guiding us individually with helpful suggestions, correcting our stances, and encouraging us when we’d done well. I had to laugh when she told me to relax my face. I could only imagine the look of concentration, determination, and confusion I was wearing. Oh well! I also loved that the lights dimmed as the class progressed, and the music was calming, not overwhelming or distracting. I would definitely return to Village Yoga. 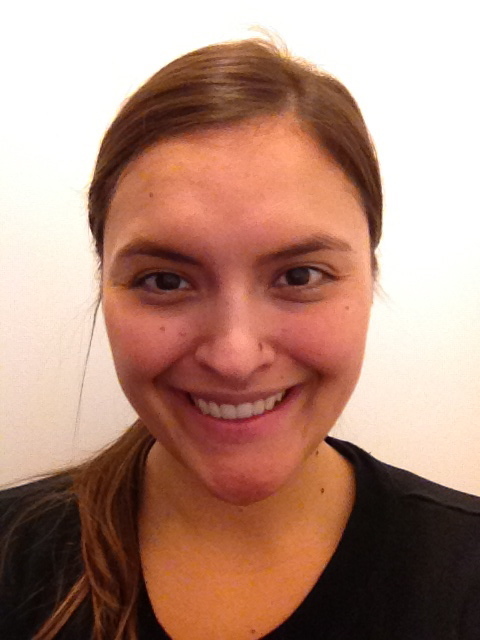 Alyson is patient, kind, and friendly. And I felt like I got a good workout too. 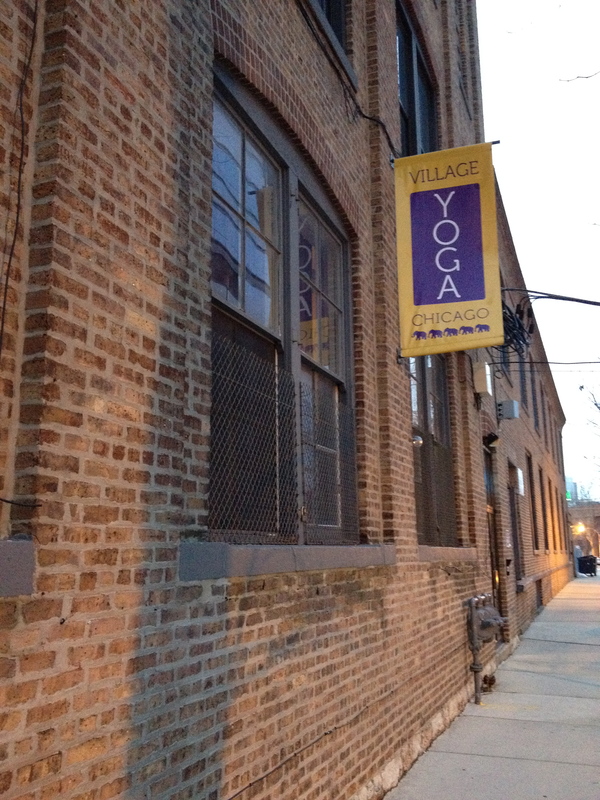 Special thanks to Erica for giving me the tip, and congrats to Village Yoga on a new location opening! I wish you much success. Om shanti om.